The mite that causes the abnormal growths cannot be seen with the naked eye, which makes it difficult to control before it has infiltrated your plant(s). Very often the first sign of gall mite is a new inflorescence that emerges from the plants all crooked and bent. Upon closer inspection you may see the first signs of frilly growth on the peduncle which develops into unsightly galls on the flower raceme as it matures. 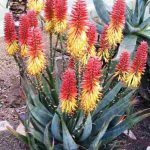 The same galls may also start as an irregular growth on the base of some of the older leaves, often where an earlier inflorescence has dried.The old flowers of the very popular Aloe Barberae (previously Bainesii) or Tree Aloe are often the source of infestation. Huge galls form on old inflorescences and, if left untreated, spread their unwelcome inhabitants over kilometers for many years. The gall mites travel through the air.Treatment: Cut away the affected tissue with a sharp blade (e.g. carpet knife) and treat the cut with a strong solution of Aphicide or other systemic insecticide. 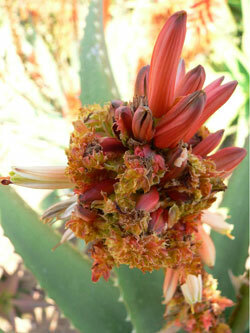 The whole plant can be sprayed with the manufacturer’s recommended solution of the same insecticide a day or so later. Be careful not to cut or spray during wet weather. 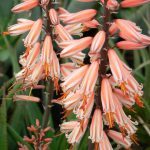 Aloes that are touching an infected plant are particularly vulnerable. Keep an eye open for signs of infection on nearby plants. Note: Some mite populations show resistance to systemic insecticides, or develop resistance, so alternating treatment is important. Blue Death Powder can be used effectively in such a programme. 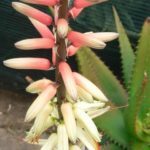 It is best applied to a fresh cut.The new treatment for gall mite, although still experimental, is producing such good results that it can now be revealed – a first for Sunbird Aloes! The plant to be treated must be dry and kept dry for the duration of the treatment. It involves simply painting only the abnormal growth with undiluted formalin (formaldehyde), readily available from most large chemists as a 40% solution. Use it sparingly on a small brush and prevent dripping and runoff, and take care not to get any on your hands. Repeat the treatment after 3 days. Inspect the area again after another 3 days and only repeat if there are still signs of green growth. Large galls should be cut away first and given adequate time to dry/heal (about 2 weeks). After this signs of regrowth can be treated with formalin as indicated.It may be better to cut away the frilly growths on an inflorescence and not to use a strong chemical like formalin near buds or flowers. Be aware that formalin can also kill healthy plant tissue, so be sure not to apply formalin on an open wound and not any further than the cancerous growth itself. Please let us know your results.Insecticides/miticides that can be used in an alternating spray programme: Aphicide, Parsec, Pride, Milbeknock, Blue Death (powder). All of these are best applied when gall have been removed surgically. Please note that formalin is NOT to be applied to an open cut – see above.Updated 12 May 2014.